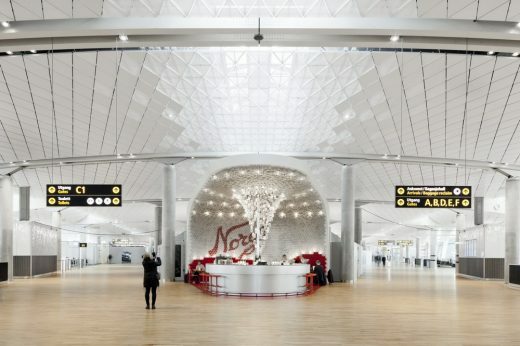 Snøhetta has designed a unique bar and interior concept for the expansion of Oslo Airport. 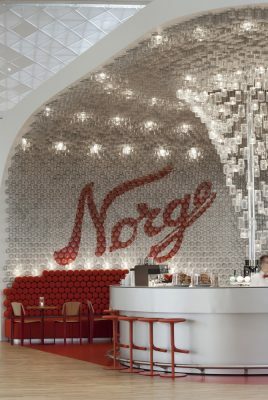 Located centrally in the new domestic terminal, the playful design of Norgesglasset draws inspiration from its namesake, the Norgesglasset jar, a classic product long used for pickling and storing food familiar to many Norwegian homes. 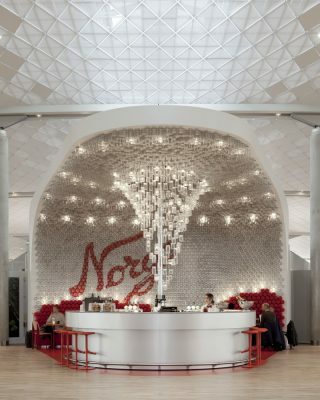 Snøhetta re-used over 4000 original Norgesglasset jars to clad the ceiling and back wall of the 65m2 bar. 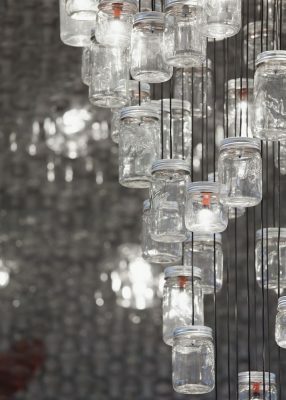 Selected jars are lit from within, doubling to illuminate the space and creating whimsical variations in light and shadow. As one continuous organic form, the glass structure of the curved back wall rises 4.8m in height from floor to ceiling to project over the seating area. 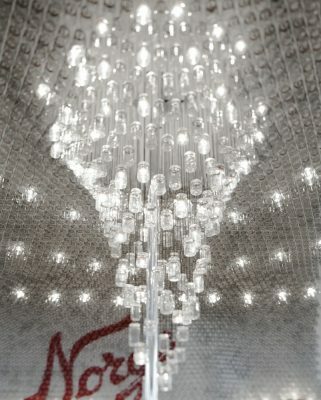 A swirling grand chandelier, also composed of Norgesglasset jars, is suspended from the center of the arched ceiling, catching the eye with its glittering play of light. 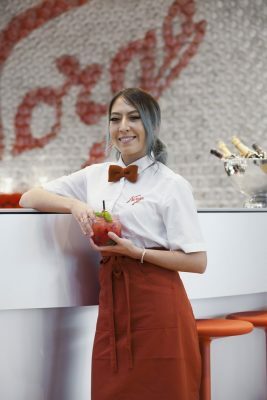 Designed and produced by Norwegian glassworks Hadeland Glassverk, the traditional jar is known for its distinctive red rubber gasket and grey aluminum lid, elements which are reprised in the design of the bar through its simple color and material palette. 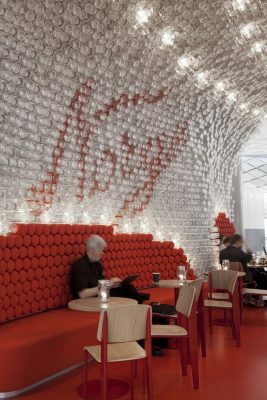 A long couch wraps around the back wall, and the where the glass cladding meets the couch, the structure changes from glass jars to bright red cushions, evoking the color of the jar’s rubber gasket. Keeping a simple and intuitive concept, the seating furniture has been given various shades of red, complementing the red rubber floor. 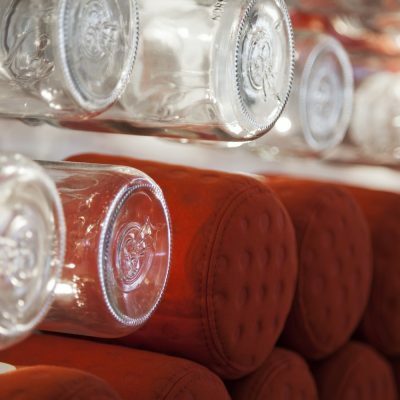 The bar’s round form references the aluminum ring that seals the top of the Norgesglasset jar. With its circular shape, the bar is a unifying element and a natural gathering point in the space.